Mobile wallet concept in India is still in the nascent stage, which is restricted primarily to tier 1 cities. However, with the exponential growth of smartphones & tablets in the country, increasing mobile internet subscribers and entry of new players, the market for mobile wallet in India is expected to register swashbuckling growth over the next six years. According to 6Wresearch, India Mobile Wallet market is projected to generate $11.5 billion by 2022. Reserve Bank of India expected measures to increase the mobile wallet limit and players investing heavily in the marketing campaigns would further fuel the growth of the market. Telecom and broadcasting vertical is the leading revenue contributor in the overall market followed banking vertical. In the forecast period, banking vertical is expected to grow with fastest CAGR amongst all verticals. In application market, recharge application captured lion share of the market. The report thoroughly covers the market by verticals, applications, devices used and regions. The report provides unbiased and detailed analysis of the on-going trends, opportunities/ high growth areas, market drivers, which would help stakeholders to device and align market strategies according to the current and future market dynamics. 13.2	Citrus Payment Solutions Pvt Ltd.
13.6	Novopay Solutions Pvt Ltd.
13.7	One MobiKwik Systems Pvt Ltd.
13.8	Oxigen Services (India) Pvt Ltd.
13.9	Paytm Mobile Solutions Pvt. Ltd.
13.10	PayU Payments Pvt Ltd.
13.12	Y-Cash Software Solutions Pvt Ltd. Growing penetration of smartphones & tablets, gaining consumer confidence and surging mobile internet subscribers are the key factors that are spurring the market for Mobile Wallet in India. In the country, the market is primarily driven by telecom and broadcasting vertical market followed by the banking vertical mobile wallet market. The mobile wallet service market is expected to experience further growth in the forecast period due to the increasing awareness, growing acceptance of prepaid payment instruments and rising government initiatives in the country. Amongst all the applications, recharge and money transfer application market has generated largest revenue share of the market pie in the country and would maintain its market leadership through the forecast period as well. 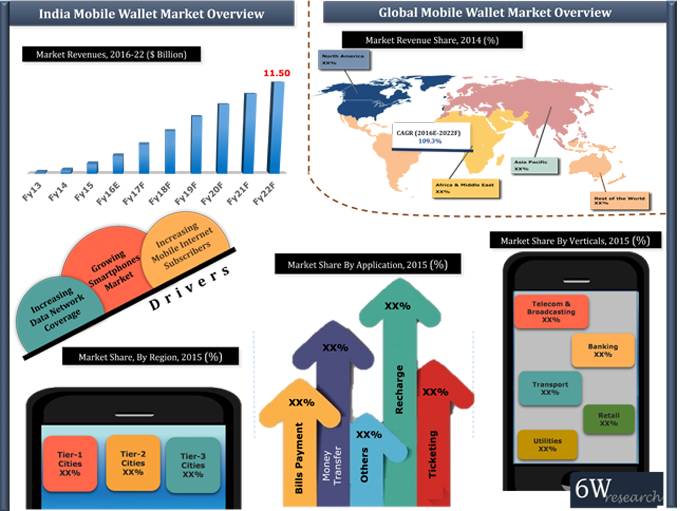 “India Mobile Wallet Market (2015-2021)” report estimates and forecast overall India Mobile Wallet market by revenue, volume of transactions, average value of a transaction, verticals such as telecom and broadcasting, banking, transportation, utilities and retail, applications and regions such as tier-1 cities, tier-2 cities and tier-3 cities. The report also gives the insights on market trends, company profiles, market drivers and restraints.